If you’re a child of the American Southland or Appalachia, odds are you have come across “bottle trees” at sometime or another in your life — typically a bare tree that may have dozens of bottles covering dead limbs and branches. In other instances, the bottles would be attached to trees via string tied around the branches. In more recent decades this bizarre practice has become largely decorative, however, less than a century ago, the act of placing bottles over tree branches or tying them to limbs was a spiritual act rooted in African voodoo and witchcraft. 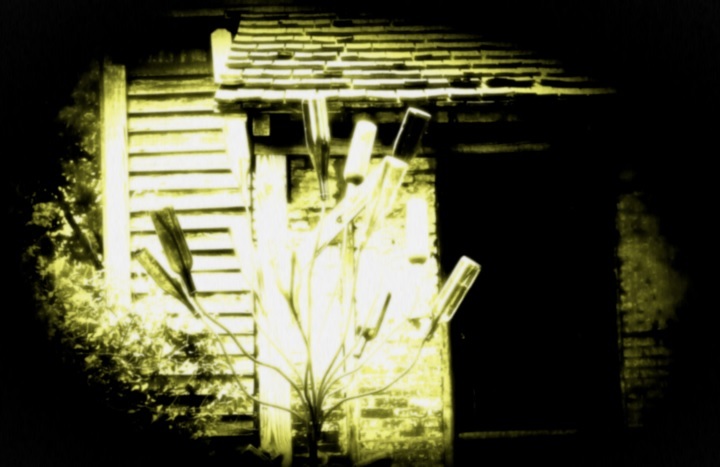 According to historians, “Bottle Trees” came to the Old South from Africa with the slave trade. Bottle trees were an African tradition, passed down from early Arabian traders. They believed that the bottles trapped the evil spirits until the rising morning sun could destroy them. The use of blue bottles is linked to the “haint blue” spirit specifically. These bottles would often be tied to trees near a crossroad or at a prominent location in order to capture any spirits which may be traveling. Though the superstition has all but been lost in recent years, the practice is actually rising in popularity throughout the nation as a popular garden decoration.